The feature I am going to describe in this post would definitely deserve a better visual representation since almost nobody I've asked doesn't know about it. Anyway, despite this visual imperfection it's very useful for any developer who deals with pages that contain number of script files. See the following screen-shots. It shows a list of scripts included in the current page. The list of scripts is pretty long (didn't fit in the image) and you even need to scroll the menu content to see its end. Important is the plain Type any key to filter list note at the top! If you start typing at this moment, the list will be automatically filtered. Let's say, I am looking for harModel.js file and so, I am typing har. The list looks like as follows then. Much better now, I see only files with har in their names! Any feedback appreciated, here on my blog or on Firebug newsgroup! 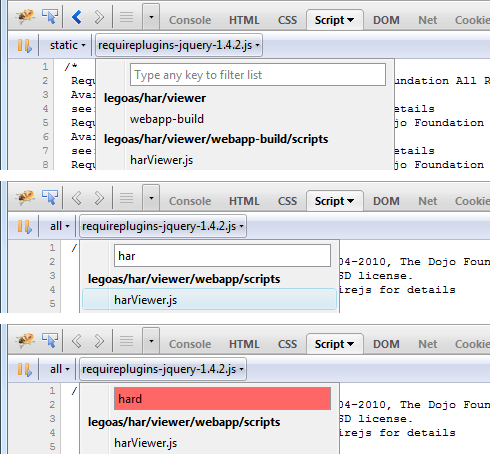 Update: Firebug 1.7a9 improves the way how this feature is presented. Based on proposal from Sam Hasler. Personally, I didn't notice the "Type any key" message, possibly because it's formatted the same way as the filepath directly beneath it. Make it a text box with "Type any key to filter list" as the placeholder text. @Sam Hasler: I like that idea. 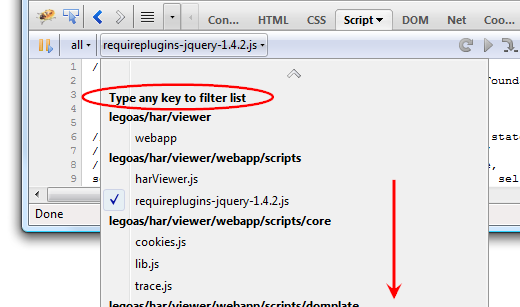 >> Make it a text box with "Type any key to filter list" as the placeholder text. Use it everyday, could not live without it. Like it like it is. This already improved the visibility a lot! Actually, I do have a small complain. When you start typing, the first matching file is selected. Then you can use arrow-keys to navigate between files. However, the first down stroke does not go down, it stays on the current file. It only starts moving at the second stroke. @JB: Great thanks! I have already did some exploration of the problem (it's actually harder to fix than I originally though).